Donor Data is the information collected about the people who donate to your campaign. For example you may need their name and email address to send a donor information about a perk, trying to track donations, or trying to look at specifc numbers on a call. 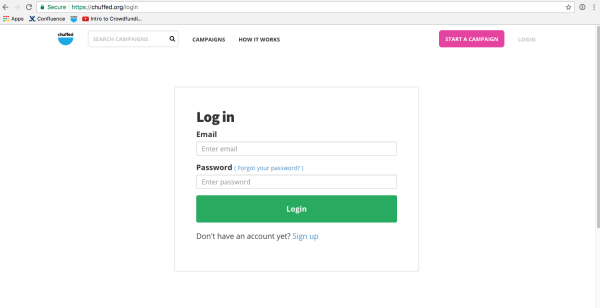 You can access real-time data on your donors at any time by logging into your Chuffed.org account, choosing your campaign and then clicking on 'Donor Data'. You can also download everything as a CSV file if you need to upload the data into your donor management system. How do I get my donors’ data? 3. 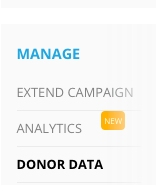 Scroll down to the “Donor Data” section under the "Manage" heading on the left-hand side of the screen. You will find details of all of your donors, including receipts for all of your donations. You can download this data as a CSV file.